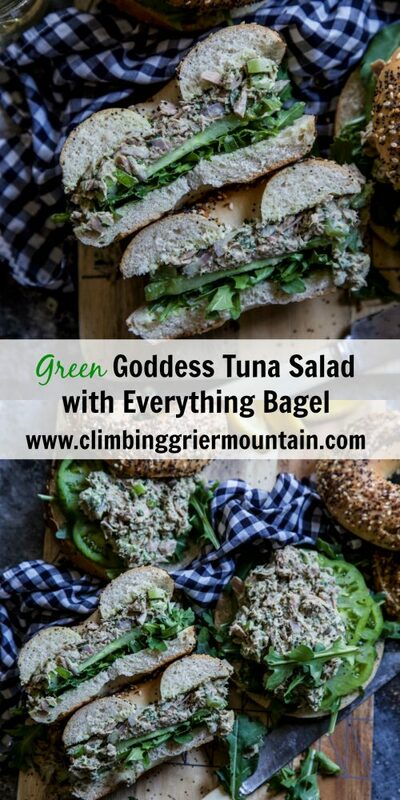 Green Goddess Tuna Salad with Everything Bagel is a light and delicious sandwich bursting with flavor! We’re headed your way tomorrow! EEEEK! I can hardly contain my excitement. I realize a lot of folks make the voyage to Canada because hello, we’re next door neighbors. BUT! I’ve never been so my anticipation and excitement are at 11/10 situation. True story: when I was a little girl the night before we would take our annual trip to Table Rock Lake, I would sleep in my swimsuit on the couch by the front door. I think that might have been a foreshadow to how much I love traveling! Anyway, I want to say thank you to everyone who gave me recommendations on where to go and where to eat while we are in Montreal. 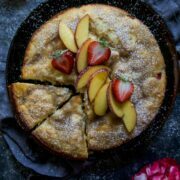 We are definitely trying La Banquise for poutine, Foxy (restaurant that only serves food made using a charcoal grill), Tapeo for tapas and then winging everything else! I’ve heard that Montreal food scene is off the charts! Besides eating and drinking we will also be attending the Grand Prix on Saturday. Have you ever been? The Grand Prix is a series of Formula One races and is one of the highlights in Montreal during the summer. I’m super pumped to watch the race, do some people watching and possibly get to drive an actual Formula One car! 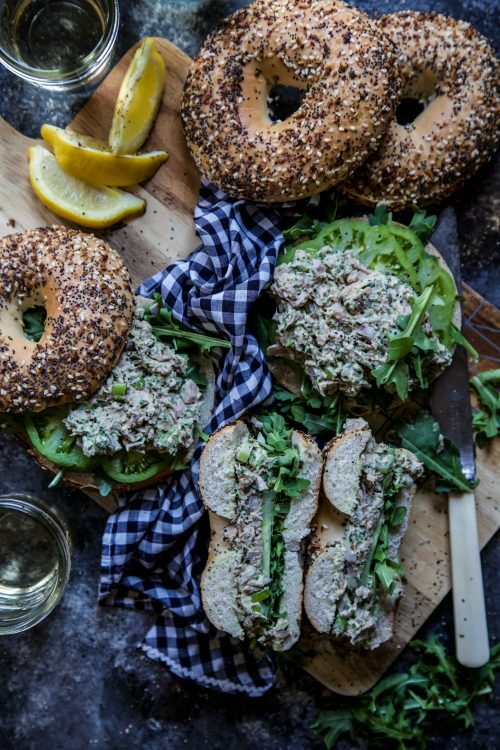 Okay, before I forget, let’s talk real quick about this Green Goddess Tuna Salad with Everything Bagel. 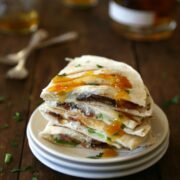 During the summer I need a quick sandwich that won’t weigh me down when it’s a bazillion degrees outside. 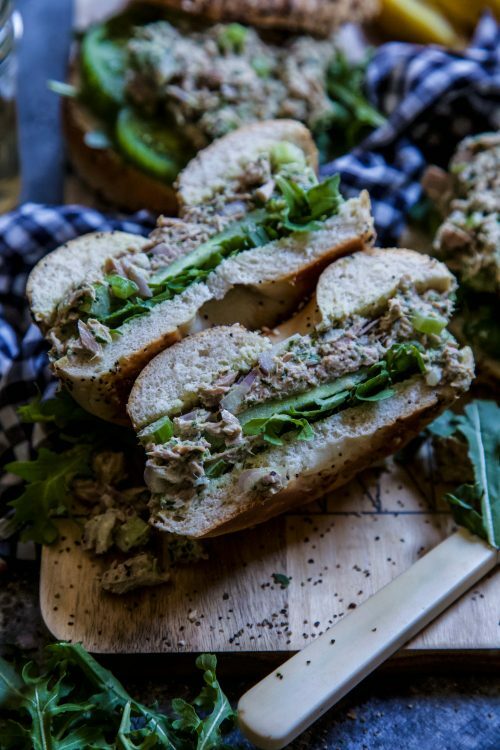 Green Goddess dressing will take any protein to another level, but when mixed with tuna, it’s like an old school sammie gets a huge makeover. Plus, it takes 2.2 nano seconds to make. 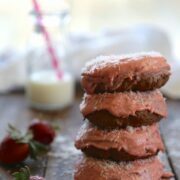 Slather it onto an everything bagel and you’ll be cruising through summer without a single drop of sweat. In a food processor add basil, parsley, tarragon, mayonnaise, sour cream, lemon zest, lemon juice, and olive oil. Puree until smooth and pale green. 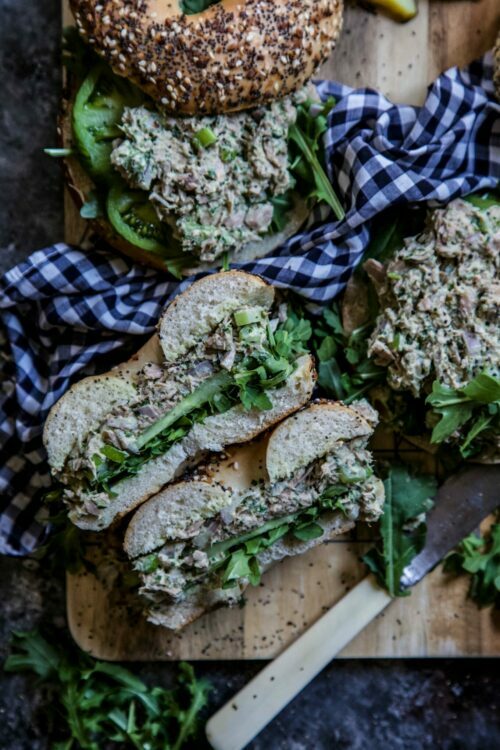 In a medium bowl combine tuna, celery, shallot, garlic, salt and pepper. Next, pour in the green goddess dressing with the tun and stir to combine. 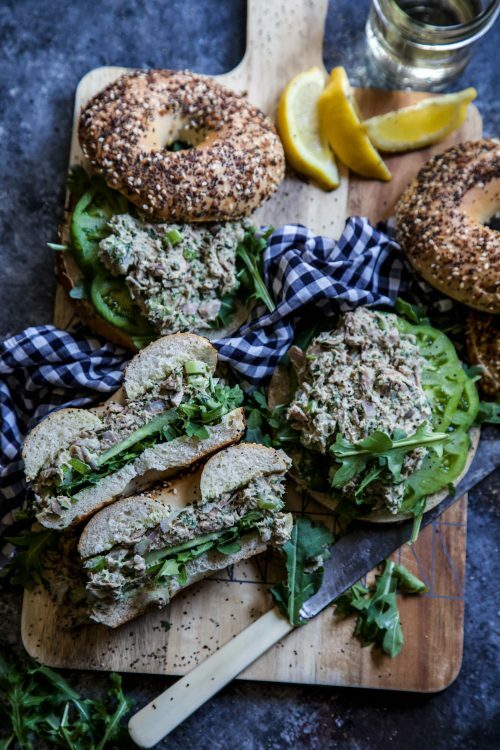 To serve take a bottom of a bagel and place a handful of arugula on top followed by tuna and tomato slice. 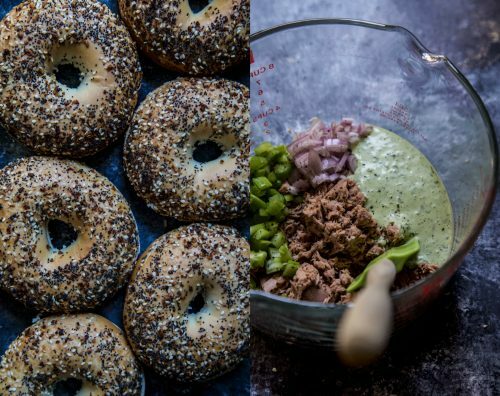 Top with other slice of the bagel. Repeat until all sandwiches have been assembled. 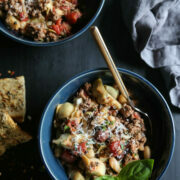 Do you think this would keep for a week of lunches? Hi Caitlin! 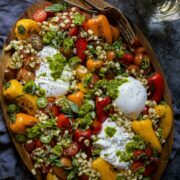 The dressing itself will keep up to a week in the fridge. 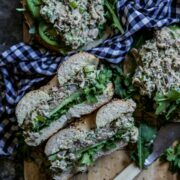 I would suggest holding off on tossing it with the tuna mixture until the day of for lunches just to make sure everything tastes fresh. If not, I would recommend only up to three days if everything is tossed together. Let me know if you have any more questions. Thanks! 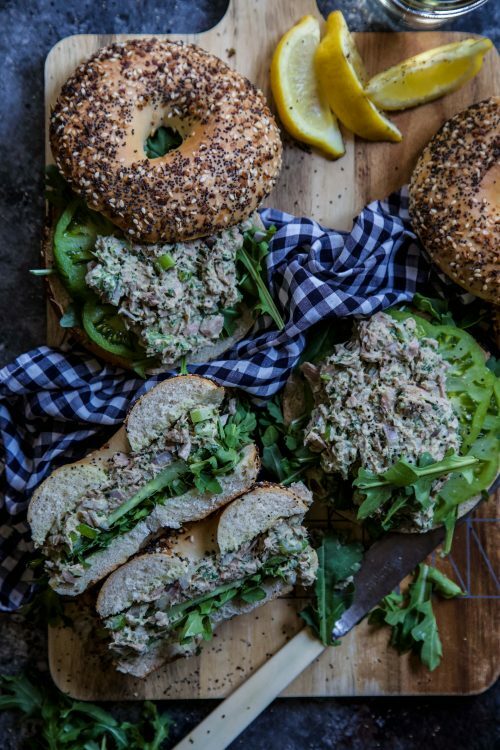 THIS is a tuna salad I can get down on! Hellllo lunch on repeat!